The town of Moraira, lies about 8 kilometers away from Teulada. Nestled Tranquility in Moraira. Right in between Denia, Calpe and Altea, Moraira is a tranquil town on the Costa Blanca with an important active tourist community, both those living there all year round as well as those who either just visiting it once or coming back every summer holiday. This old fishing town with the Mediterranean Sea stretched out at its feet and a beautiful mountain range covering its back maintains an average temperature of about 18 degrees. Thanks to its tourism, this town has known how to mix all the necessary and modern services into its typical fishing port ambiance. Proof of this is the magnificent fish auction that is held from Tuesday to Sunday in the Lonja (public exchange market) right in the port area. The Province of Alicante where Benidorm and Torrevieja are found is defined as having fine sandy beaches, rocky ones and mysterious coves and, these are some of the choices that the 8 kilometres of shore with the Blue Flag of the European Community can also offer you in Moraira. Either on foot or with small boats, this long stretch of beach area has crystal clear waters, restaurants right on the beach, parking areas, Red Cross services and showers. One nice cute cove with a lot of history is the one called the Portet. It was the place of shelter for Phoenician, Greek, Roman, Arab or privateer sailing or trading ships. Today its a well equipped zone for doing all kinds of nautical sports. And from there we can take a stroll to the watch out tower near the Cap d’Or ( the Golden Cape). This tower is on the most elevated part of the cape, overlooking the beach mentioned before. The Cova de les Cendres ( the Cendres Cove) is an Archaeological field from the Upper Palaeolithic times about 40 metres above sea level. In the near future there will be a museum near this cove with all the findings. 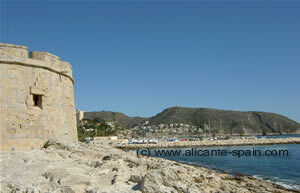 The castle of Moraira was built in 1742 and there is a shield from the Royal Borbon family over the door way. If either coming along the national highway N-332 or by AP-7 ( pay highway), the landscape is filled with vineyards and there is a nice wine cellar to be visited. There is a great street market in Teulada, just 8 kilometers inland from Moraira. If you are lucky to be there in July, the Patron Saint is the Virgin of the Unsheltered and the Virgin of Carmen who is said to protect the sailors and fishermen. There is a beautiful parade and fireworks and a water procession with the statue of the Virgin floating among endless bouquets of flowers. Quite a scene to be seen! To sum it up, Moraira is really worth a visit. With its mild Moraira weather and its traditional way of life, the town found its way to maintain its identity and combine it with the goods of modern tourism. 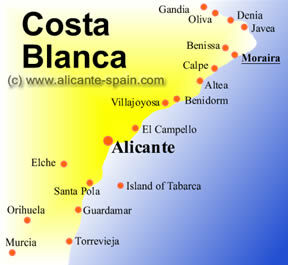 If you are in the area, you should really visit Moraira and see for yourself.